OfficeTools WorkSpace Portal allows you to transfer files to and from your clients securely in a quick and easy format. As such, the amount of data that exists on WorkSpace Portal can become an issue. 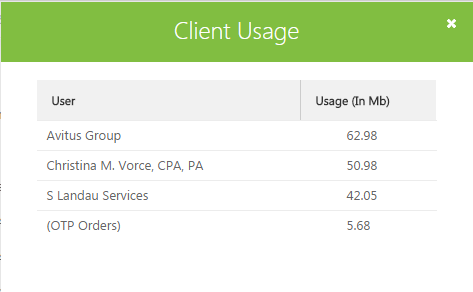 To view the clients that have the highest usage on your account, you can access a list in your Admin Panel that will show you the amount of storage being taken up by specific clients. To access the Client Usage list in WorkSpace Portal first navigate to the portal website, officetoolsportal.com, and log in using your credentials. Once logged in to WorkSpace Portal, click on your name located in the black bar at the top of the screen and click on the Settings option. The first tab, Admin Panel, should be selected by default, and in the left hand column of information you will see an option that says “Client Usage: See Usage”. If you click on the See Usage button, a window will pop open with a list of your contacts and their usage on the portal. On the left hand side will be the client name and on the right hand side will be the amount of space that each client is using on your account. Depending on the amount of space you signed up for when you purchased WorkSpace Portal, this tool can help make sure you don’t exceed the allotted amount. The contacts are ordered by the amount of the space they are taking up so that you can systematically decide which contacts to clean up. If you click on the desired contact, WorkSpace Portal will navigate to the Documents view and filter all documents down to the ones that belong to the selected client. At that time, you can use the checkbox on each document to mark it to be deleted and delete multiple documents at one time. Please note that this is only removing them from WorkSpace Portal and NOT from your local WorkSpace Document Management. Alternatively, you can also access OfficeTools WorkSpace directly on your desktop and remove the desired files from WorkSpace Portal using the Portal button from there, choosing View All Files and deleting them. The purpose of this tool is to easily access the contacts that take up the most space and remove the documents that don’t need to be on WorkSpace Portal anymore. Why is OfficeTools crashing when I download a document from the Portal? Can I send a tax return to my client from WorkSpace? Why does my client portal say “This Feature is Coming Soon”?